Who are the Activists Changing our World? The twenty-first century saw the most remarkable social changes of our country’s history. 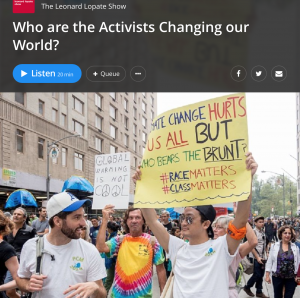 On Jan 14, 2016, visual artist and cultural organizer Rachel Schragis, Rinku Sen, publisher of Race Forward and Color Lines, and Greg Jobin-Leeds were invited to The Leonard Lopate Show produced by WNYC to discuss the book. WNYC 93.9 FM and AM 820 are New York’s flagship public radio stations, broadcasting the finest programs from NPR, PRI and American Public Media, as well as a wide range of award-winning local programming. WNYC is a division of New York Public Radio.